and (first name unidentified) Meatti, Foreman for the General Dynamics Complex. Original black and white photographic print, October 8, 1962: Private Collection of Dr. Calvin "Cal" D. Fowler. Digital reproduction of original black and white photographic print, October 8, 1962. Dr. Calvin Fowler Collection, Florida Space Coast History Collection, RICHES of Central Florida. Originally owned by Dr. Calvin "Cal" D. Fowler. Copyright to this resource is held by Dr. Calvin "Cal" D. Fowler and is provided here by RICHES of Central Florida for educational purposes only. "Sigma 7 MA-8 (25)." 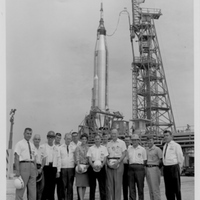 John F. Kennedy Space Center, National Aeronautics and Space Administration. http://www-pao.ksc.nasa.gov/history/mercury/ma-8/ma-8.htm. 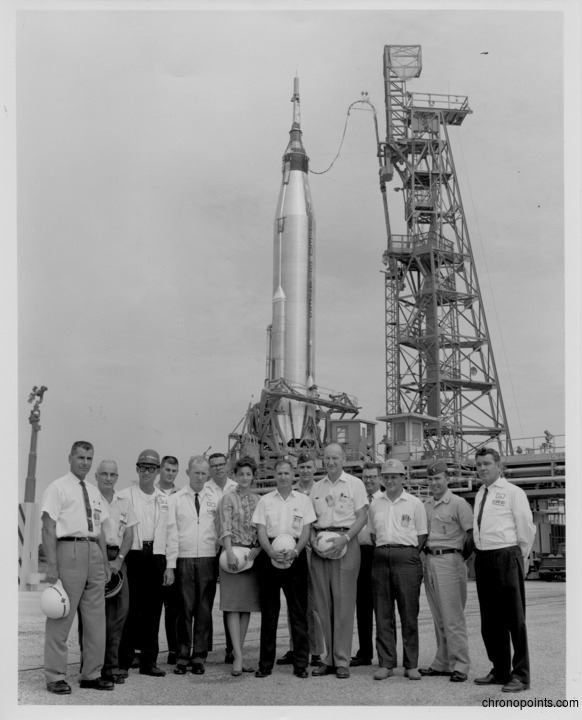 “Launch Crew Members in Front of Sigma 7 Mercury-Atlas Launch Vehicle at Cape Canaveral Air Force Station Launch Complex 14.” RICHES of Central Florida accessed April 22, 2019, https://richesmi.cah.ucf.edu/omeka/items/show/5002.